The first edition of Yokohama Triennale set out to explore the distinct features of Yokohama, using the former red brick warehouse, as well as the Pacifico Yokohama Exhibition Hall and other nearby locations as exhibition venues. In addition, by introducing Asian artists and presenting multidisciplinary works, the event explored a new approach to find an international exhibition that would be unique to Yokohama. 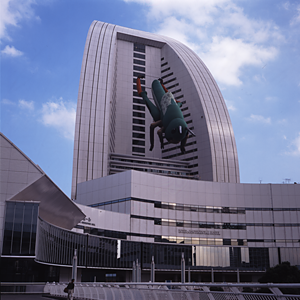 One work, shaped like a huge locust, measuring some 35 meters in length, appeared on the exterior of the InterContinental Yokohama Grand Hotel. It was greeted with excitement by local residents for its sheer scale and unconventional form. The event provided the general public with an excellent opportunity to see contemporary art.